Gaunt Industries, Inc. HYPO-49 is a favorite tool used by Quilters worldwide. 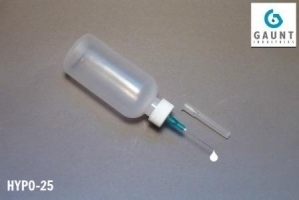 The 2 ounce LDPE soft squeeze bottle is easy to use with your favorite basting glue. Glue Baste Applicator – Gaunt Industries - manufacturing the original Precision Applicator since 1949. Serving quilters, crafters, artists, DIY, hobby enthusiasts, and other industries Worldwide. With a commitment to quality we supply products for applique, fine oiling, painting, greasing, and cementing. Our Newest product - Paint Brush Applicators - Now shown on YouTube and sold on our website. We're excited to launch our newest product line. Gaunt Industries' FLOW THRU PAINT BRUSH APPLICATORS are now available on AMAZON.com. Paint or various liquids are delivered directly from our soft squeeze plastic bottle through to the brush. Gaunt Industries products are recommended on many forums and blogs. The HYPO-25 is a tool discussed on one of the RCUniverse.com - RCwarbirds - warplanes forums- used for precision painting of rivets. We are currently working with former A-West customers. Contact us if your looking for a replacement to the A-West Needlepoint Applicator style bottle.